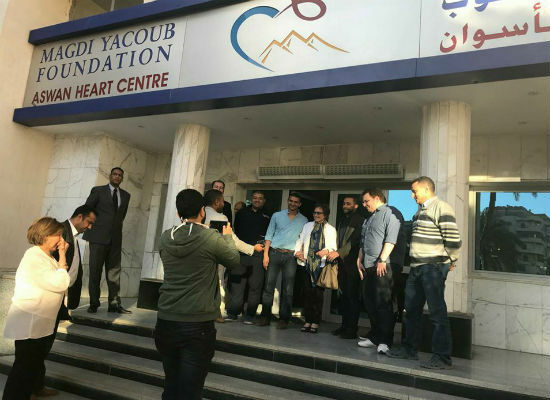 Djamila Bouhired, the legendary Algerian activist, feminist and revolutionary figure, visited the Magdi Yaqoub Heart Surgery Hospital in Aswan during her visit to attend the 2nd Aswan International Women's Film Festival, which concluded on Monday 26 February. This year’s edition of the festival bears her name “The Round of Djamila Bouhired." In her visit to the hospital she was accompanied by journalist Hassan Abul-A’ala, director of the film festival. Bouhired praised the hospital and its potential, and its service to its patients free of charge, without any distinction based on the social class, skin colour, or gender. After viewing a documentary on the hospital's mission, the Algerian activist commented that it "is a great human work that serves humanity." Visiting the children's ward, she was extremely touched to see newborn babies who had undergone heart surgeries. Doctors at the hospital offered her a free check-up during her visit, but she politely declined, noting that there were many people in greater need than she. 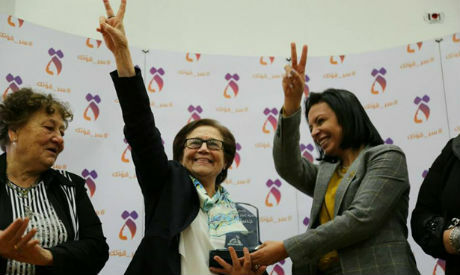 Later, in a ceremony attended by Minister of Culture Ines Abdel-Dayem and the Egyptian ambassador to Algeria Omar Abu-Aish, Bouhired was honoured by the Egyptian National Council for Women (NCW), represented by its President Maya Morsy. The 80-year-old Bouhired was an active member of the Front de Libération Nationale (FLN) and spent her younger years fighting the French colonial occupation. Hailed as a freedom fighter in Algeria, she is also widely revered in Egypt. In 1958, late Egyptian filmmaker Youssef Chahine directed a film that catalogues Bouhired's struggle. The revolutionary figure was played by Magda El-Sabahi.